The BBC has decided to close eight of its 12 European language services as part of a wider reorganisation of external broadcasting. The BBC's Europe analyst Jan Repa looks at a radio history which began in the 1930s. The BBC's vernacular broadcasts to Europe were born out of the struggle against German Nazism and Italian Fascism - and the Cold War confrontation with the Soviet Union. External broadcasting - in English - began in 1932. It was aimed specifically at white listeners in countries like Australia, Canada and New Zealand, in an attempt to persuade them to remain within the British Empire. In 1933, the Nazis came to power in Germany. 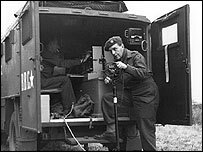 By the time World War II began in 1939, the BBC was broadcasting in German, Italian, French, Spanish and Portuguese. As the German war machine swept across Europe, the BBC was soon broadcasting in Polish, Czech, Slovak, Hungarian, Dutch, Serbo-Croat, Albanian and others. By the time war ended in 1945, the BBC was offering programmes in 45 languages worldwide. Hugh Greene - later to become director general of the BBC - explained the editorial philosophy thus: "Having heard us talk frankly about our defeats, listeners would believe us when we talked of our victories." With the onset of the Cold War, BBC broadcasting to Europe faced new challenges. Unlike America's Radio Liberty and Radio Free Europe, the BBC was not a propaganda station. The basic premise continued to be that - when presented with the facts - listeners would draw their own conclusions. Unlike the American stations, for instance, the BBC did not encourage the Hungarians' failed uprising against the Soviet Union in 1956. That policy created its own tensions - with some of the more recently arrived staff feeling that the BBC was not "engaged" enough in what they interpreted as a struggle against the Communist regimes. BBC language sections have come and gone. German-language broadcasts were stopped in 1999 after 60 years. The BBC announced that audience research indicated that a large number of decision-makers in Germany now listened to the BBC in English. The Frankfurter Allgemeine Zeitung newspaper retorted that "From now on, anyone who doesn't speak English well enough isn't worthy of the BBC". Dutch, Finnish, French for Europe, Italian and Spanish all disappeared over the years - as did Japanese, Hebrew and Malay. Through the Cold War, non-Russians in the Soviet Union had no option but to listen in Russian. Only after the Soviet Union disappeared in 1991, did the British government authorise broadcasting in languages like Ukrainian, Uzbek, Azeri, Kazakh and Kyrgyz. Albanian - abolished in 1967 - was resurrected in 1993, against the background of the Yugoslav wars. Over the years, the BBC has served as a training ground for European journalists, who have - in a number of cases - gone on to make significant media careers in their home countries. However, the nature of broadcasting continues to change. Fewer people in the developing world now use radio as a primary means of acquiring information. Today's announcement marks the biggest single change in the BBC's broadcasting strategy for Europe since the 1940s.